B.J.Healthcare is a prominent Manufacturer, Exporter and Supplier of Antispasmodic Tablets. Antispasmodic Tablets, available with us, are known for providing great relief in the problem. 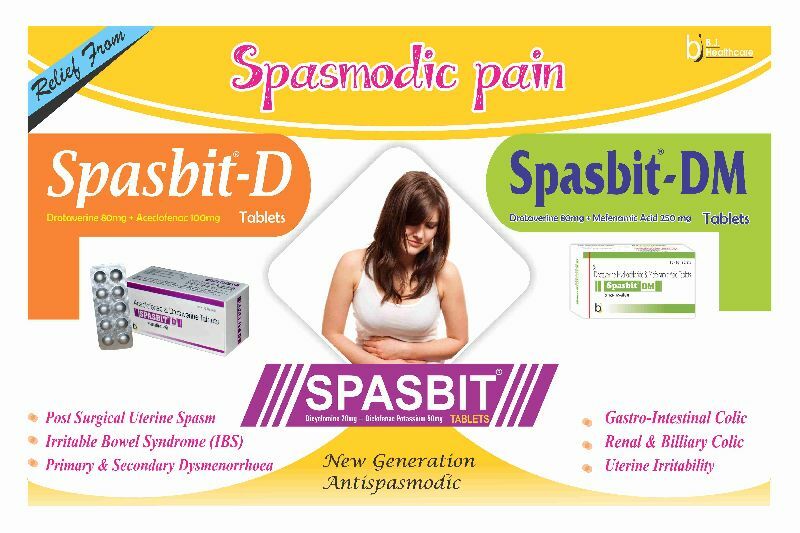 Antispasmodic Tablets including Spasbit Tablets and Spasbit-D Tablets are offered by us in hospitals, health care centers, etc. Avail Antispasmodic Tablets from us at very reasonable prices. We are a well-reckoned Spasbit-D Tablets Manufacturer, Exporter and Supplier located in Gujarat. The Spasbit-D Tablets ensure prompt control of spasm. Also, the Spasbit-D Tablets provide excellent relief in pain. Avail Spasbit-D Tablets from us at very competitive prices.